Home / Specials / Gaza’s Water Crisis / How Does the Water Crisis Impact Life in Gaza? Elderly man fills water container at the public sink of Khan Yunis Water Authority’s wastewater treatment plant, 2014. Photo: Muhammad Sabah, B’Tselem. Gaza’s water crisis affects every one of the territory’s 1.76 million inhabitants. Municipal tap water, which is often cut due to power shortages, is too salty to drink, so that people have to buy their drinking water from private vendors. The heavy pollution of water resources in the Gaza Strip has a severe impact on public health; children are particularly at risk from water-related diseases. In addition, the local economy, agricultural production in particular, and the environment suffer the consequences of the water scarcity and pollution. As the water crisis has worsened over the decades, the citizens of Gaza have had to develop a range of strategies to cope. Water distributed through the water supply network to homes in the Gaza Strip is not fit to drink due to its high salinity. Gazans refer to this water as “the salt water”. This water also contains high levels of nitrates and other pollutants that do not affect the taste or aspect of the water, but which are dangerous to public health. Due to its salinity, municipal tap water is generally only used for household chores and for washing, frequently causing skin diseases and other infections. Furthermore, frequent power outages and low network pressure cause constant water cuts and shortages. 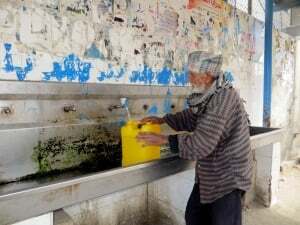 Gazans mainly get their drinking water from private vendors, who deliver water from more than 40 private desalination plants that have sprung up over recent years. The Palestinian Water Authority has only licensed about half of these plants, and none of them is monitored for the quality of the water they produce. Users receive deliveries of this water by tanker truck, or go to fill up jerry cans at the small tanks that exist in corner shops and supermarkets across the Strip. The prices are high ($1.30 for 100 L), and poor families may spend up to a third of their income on drinking water supplies. Half of the children in Gaza suffer from parasitic infections as a result of the contamination of water resources, 2010. Photo: Middle East Children’s Alliance. Drinking heavily saline and contaminated water can have severe health impacts, particularly among children. According to the World Health Organization, Gaza’s contaminated water is responsible for 26% of all disease in the territory, and 50% of Gaza’s children suffer from water-related parasitic infections. Intestinal parasites infect children throughout Gaza, but children living in agricultural communities and near sewage ponds are particularly at risk. Parasitic infections and chronic diarrhoea also affect child growth and development. Drinking saline water can cause kidney dysfunction, heart failure, neurological symptoms, lethargy and high blood pressure. Excessive levels of fluoride are toxic, causing gastritis, ulcers, kidney failure, bone fluorosis (causing bone fractures and crippling), and tooth fluorosis (causing black lines around gums and tooth decay). High nitrate levels cause “blue baby” syndrome and gastric cancer. Moreover, the sanitation setting in Gaza is so poor that it is conducive to the outbreak of pandemics such as cholera. High nitrate concentration in drinking water is particularly dangerous for infants, as it can induce blue baby syndrome or methaemoglobinaemia. This blood disorder results in higher than normal levels of methaemoglobin, a form of haemoglobin that does not bind oxygen. Infants suffering from blue baby syndrome may show signs of blueness around the mouth, hands and feet. They may have episodes of breathing trouble, diarrhoea and vomiting. In extreme cases, the condition can be fatal. Blue baby syndrome was first registered during the 1990s in Gaza. A 2002 study found that 48.5% of babies had high methaemoglobin levels. There are no recent studies on the prevalence of blue baby syndrome in Gaza, but as nitrate concentrations have steadily increased over the past 15 years and awareness of the disease and its causes remains low, a large number of children are at risk. The poor quality of water in Gaza has a dramatic impact on the environment. 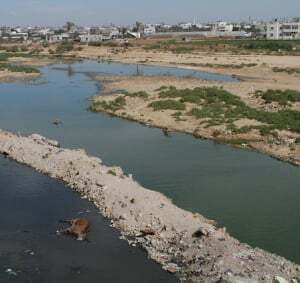 Wadi Gaza, a seasonal river that originates in Israel and flows through the Gaza Strip into the Mediterranean Sea, is choked with sewage. The lack of adequate water treatment facilities also means that raw sewage frequently floods streets, residential areas, homes and agricultural land. Along the coast, 16 sewage outlets release around 33 MCM/yr of untreated sewage directly into the sea. Fish are infected and the coastline is contaminated, impacting the quality of life of Gazans and the livelihoods of fishermen. Sewage discharges from Gaza also affect water quality further along the coast, among others at the intake of the Israeli desalination plant at Ashkelon. Poor water quality in Gaza also affects agricultural production, as the high salinity of the groundwater affects the growth of crops. Many farmers have had to abandon traditional crops such as strawberries, cucumbers and tomatoes in favour of more salt-tolerant crops. Agriculture remains the largest water user in the Gaza Strip, consuming around 60-65% of the water supply. There are more than 4,600 agricultural wells in Gaza, more than 2,000 of which were drilled illegally without supervision or regulation. This means that neither the quality nor the quantity of the water extracted from these wells is monitored. Lack of proper regulation of these wells places further pressure on Gaza’s water supply. World Bank, 2009. West Bank And Gaza Assessment of Restrictions on Palestinian Water Sector Development. Eco Peace/Friends of the Earth Middle East & INSS, 2014. The Water, Sanitation and Energy Crises in Gaza, Humanitarian, Environmental and Geopolitical Implications With Recommendations for Immediate Measures. UNICEF, 2011. 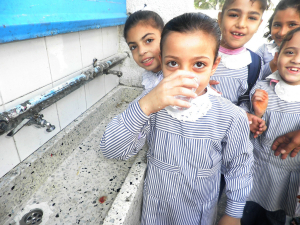 Protecting Children from Unsafe Water in Gaza: Strategy, Action Plan and Project Resources.Eco Peace/Friends of the Earth Middle East & INSS, 2014. Eco Peace/Friends of the Earth Middle East & INSS, 2014.